The Green Brain : 20 movements named after insect species, for piano solo [eScore] / Michael Kieran Harvey. 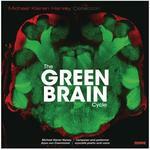 The Green Brain (1966), initially published as Greenslaves, is a science fiction novel by Frank Herbert. The book is set in the not-so-distant future, where humankind has all but succeeded in controlling life on the planet and almost completely wiped out insect life. This cycle is in twenty movements named after major insect genera, each of which take characteristics of the particular insect morphology and behaviour to generate a musical portrait. Overall the binding idea in the cycle is the similarity of anatomy, which nevertheless, through evolutionary pressures, has resulted in infinite diversity amongst insects, and indeed amongst all of life on earth and perhaps elsewhere in the universe. The cycle as a whole, though consisting of twenty separate pieces each based on a particular type of insect, is a contemplation on the possibility of the spontaneous emergence of superior intelligence amongst insects when faced with the devastation unleashed on the biosphere by humans. -- 4. Mantises (to John McCaughey) -- 5. Scorpions (to Brian Ritchie and Varuni Kulasekera) -- 6. Beetles (to Nigel Westlake) -- 7. Flies -- 8. Bees (to Martin Friedel) -- 9. Wasps -- 10. Butterflies (to John and Maria Honey) -- 11. Moths (to Gordon Marr) -- 12. Spiders (to Tom Samek) -- 13. Fleas -- 14. Ticks -- 15. Lice -- 16. Silverfish (to Raymond Shon) -- 17. Earwigs (to Gordon Rumson) -- 18. Slaters -- 19. Aphids (to Tom Vincent) -- 20. Mosquitos (to Dr Arjun Von Caemmerer). Score: The Green Brain : 20 movements named after insect species, for piano solo / Michael Kieran Harvey.